Because if Aristotle is correct, then looking for a lucky break won’t cut it. And neither will hoping to be an overnight success. You’re going to have to decide what you want to achieve with your life. And then you’re going to have to commit to it for years as you develop daily habits to continually hone your skills, build a positive reputation and establish a standard of world-class elite performance. So what are you repeatedly doing? As a spouse or partner? In your career or business? In relation to your health and wellbeing? In relation to your faith and spiritual vitality? 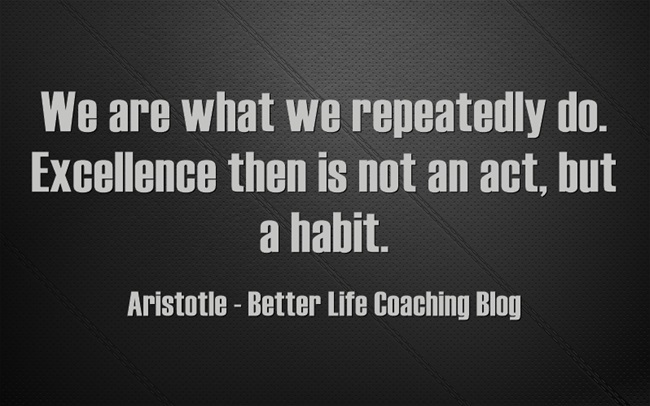 If you repeated what you did today every day for the rest of your life, would the final outcome be excellence? Previous post – Do You Ever Get the Feeling That Someone Is Watching You? « Do You Ever Get the Feeling That Someone Is Watching You?